Chasing Amazing is back online after spending a week and change taking care of my newborn son John. Sorry for the radio silence since then, but I’m sure the vast bulk of you understand. And if you don’t, come on … it was the birth of MY KID we’re talking about here! There’s just something enjoyable about seeing a character you know and love so well return to his roots. That’s why the last panel of ASM #300 has long been a favorite “stand up and cheer moment” for me as a Spidey fan. Considering the bulk of the “black suit” and Venom storyline was told when I first started reading Spider-Man comic books the official culmination of that arc, which went on for nearly 50 issues, is a logical entry in this series for me. Long before the black suit came to represent a cheap marketing plot (The mid-2000s “Back in Black” which just so happened to coincide with the Spider-Man 3 movie comes to mind) there was just something entirely edgy and different about seeing Spider-Man in an alternative black costume. 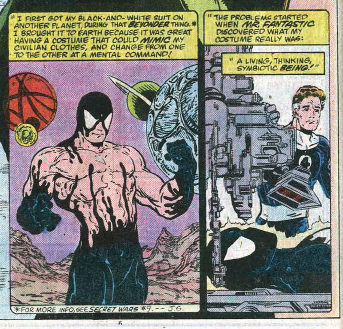 And despite the fact that it was later revealed that the suit was actually an alien symbiote that was feeding off him, I appreciated the fact that Marvel continued to keep him in black (granted a non-living black suit) even after the storyline’s big twist. Under the suit, there was nothing actually any “different” about Spider-Man, but the costume change kept things fresh, and Marvel got some good mileage out of that suit. 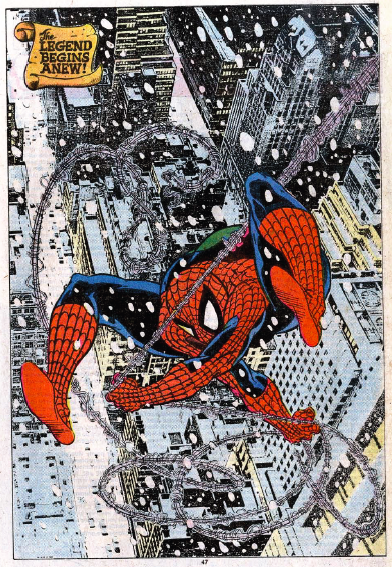 Of course, a return to the traditional red and blues were inevitable, just like New Coke was ultimately (and quickly) replaced with Coca Cola Classic, but I always applauded Marvel with how they brought Spidey back to his roots. With the introduction of the psychotic Venom, who had inherited the black symbiote that Spider-Man had initially rejected, there was now just cause for Spidey to return to his old costume. 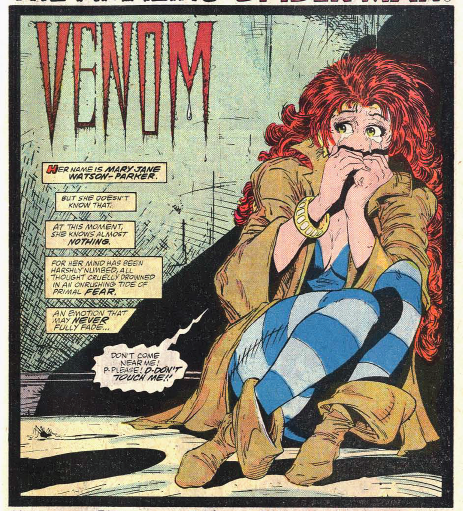 The opening panel of ASM #300, which shows the traditionally sassy and strong-willed Mary Jane cowering in the corner in fear of Peter because she thinks he’s Venom, is one of the more disturbing images in the history of the comic. It sets the tone that a return to Spidey’s traditional costume is an absolute necessity for the Parker’s. He can’t possibly go around in his black duds when there’s a homicidal maniac wearing the exact same thing. But before Peter officially makes the switch, he first needs to close-out the long-running storyline involving the black suit/symbiote. Despite Mary Jane’s fears, he confronts Venom, almost gets killed as a result because he doesn’t quite understand initially how he can go about defeating a villain who has all of his same powers and doesn’t trigger his Spidey Sense, and ultimately outsmarts the more powerful foe as only Spider-Man knows how. Both Venom/Eddie Brock and the symbiote are under lock and key and the black suit saga has seemingly come to an end after first being introduced years earlier in issue ASM #252 (and Marvel Secret Wars #8). There is still one dangling participle and that’s of course Spider-Man’s current attire. 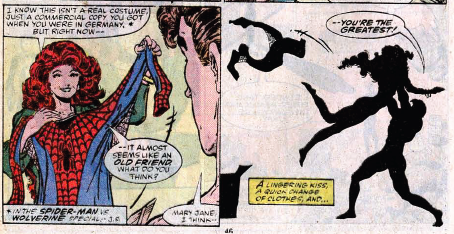 When Mary Jane busts out the imitation red and blue suit and tells Peter she’d be more comfortable with him returning to his roots, it leads to a warm, Honeymooners-esque “baby you’re the greatest” exchange between the couple. And then of course that last panel, of the “original” Spider-Man, web-slinging through the air. While the stakes aren’t quite so high as when Spider-Man was able to take down the Juggernaut and overcome Morlun, there’s something so emotionally satisfying about Todd McFarlane’s awesome illustration and of course, the simple words “The Legend Begins Anew.” It’s incredibly rare to get a true sense of closure in a single issue of a comic book, but ASM #300 is as close as it gets. In just one comic book we have a new character introduced and his origin explained; there’s an epic confrontation between hero and villain; a major years-long storyline is finally put to rest until Marvel got symbiote-fever a few years later; and new era, marked by a greater emphasis on tradition (at least from a costuming standpoint) is kicked off. I’ve been standing up, pumping my first and cheering for the duration of this post. I hope you have been as well.